Directly beneath the popular categories list is the Add a New Category section. Popular Categories are listed at the top of the screen. Clicking on a category in the list will take you to the Edit Categories screen, which is described in the next section. To add a new category enter the Category Name and Category Slug, choose a Category Parent from the drop down list, enter the Description for the category and click on the Add Category button. The category name can be the full name of the category to be used, for example "wedding". The slug will be a search engine friendly version of the category. If you do not enter the slug the system will automatically create one consisting of all lowercase words separated by a hyphen, for example "wedding ". Hint: Categories can have a hierarchy. For example, "Weddings" may be a parent category for the sub-categories of "catering", "photography" and "cars". If the category you are adding is a sub-category, choose the parent category from the drop down list. On the right of the screen is a table that lists all of the categories in the system. Clicking on the category name will take you to the edit category screen for that category. 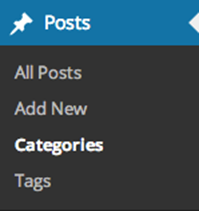 Clicking on the number under posts will take to you to the Edit Post screen with a list of posts assigned to this category. 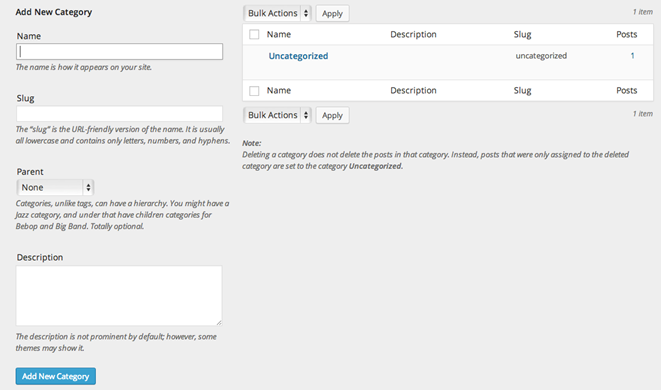 Placing the mouse over the name of a category in the list displays a menu of options as previously explained. You do not have access rights to use the category to tag converter so just ignore this option.